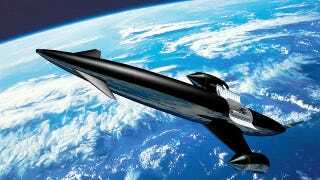 It's been a while since we last reported on the British Skylon space plane — a reusable launch vehicle that will be powered by a two-in-one air-breathing rocket engine that can boost the plane to Mach 5.5 and a height of nearly 30 km (18 miles). The latest news is that the theoretic Sabre Engine ain't so theoretic anymore; it passed a critical heat tolerance and cooling test — what will now pave the way for Skylon to move from concept to reality. And indeed, this really is big news. As Skymania's Paul Sutherland noted, it's "the biggest breakthrough in flight technology since the invention of the jet engine." The Sabre engine was the crucial piece in the reusable space plane puzzle. Once built and operational, Skylon will take off and land like a conventional plane, but still achieve orbit by mixing air-breathing jets for takeoff, and landing with rockets (fueled by onboard oxygen) once it gets past a certain speed. The recent breakthrough had to do to the development of a heat exchanger that's able to cool air sucked into the engine at high speed from 1,000 degrees Celsius to minus 150 degrees in one hundredth of a second. It's this critical technology that will allow the Sabre engine to surpass the bounds of a traditional jet engine — by as much as twofold. With the Sabre engine in jet mode, the air has to be compressed before being injected into the engine's combustion chambers. Without pre-cooling, the heat generated by compression would make the air hot enough to melt the engine. The challenge for the engineers was to find a way to cool the air quickly without frost forming on the heat exchanger, which would clog it up and stop it working. Using a nest of fine pipes that resemble a large wire coil, the engineers have managed to get round this fatal problem that would normally follow from such rapid cooling of the moisture in atmospheric air. They are tight-lipped on exactly how they managed to do it. "We are not going to tell you how this works," said the company's chief designer Richard Varvill, who started his career at the military engine division of Rolls-Royce. "It is our most closely guarded secret." Once fully developed, the Skyplane will travel five times the speed of sound and reach an altitude of nearly 30 km — what is 20% of the speed and altitude required to reach orbit. To make it all the way into space, the plane will switch to rocket mode. Moving forward, the company hopes to raise an additional $400 million to fund the next three-year development phase, which would include the construction of a small-scale version of the complete engine.